ORIENTATION: This article explores the role that meaning, as logotherapy conceptualises it, can play to facilitate organisational changes. RESEARCH PURPOSE: The purpose of this study is to explore further a model an earlier paper proposed for using employees' experiences of meaning in work contexts to facilitate changes. MOTIVATION FOR THE STUDY: The researchers could not find a comprehensive model in the literature for addressing employees' experiences of meaning in, or at, work during organisational changes. A previous paper proposed such a model, but it addressed only one component fully. This article seeks to explore this model further to address this apparent gap in the literature. RESEARCH DESIGN, APPROACH AND METHOD: The researchers used a literature review to conduct the study. The components of the model directed this review in order to find meaning at work. MAIN FINDINGS: The actions of organisations, which aim to create positive organisational contexts (through practices for improving meaning at work and transcendence) and to frame changes using 'Logo-OD', can improve employees' experiences of meaning during organisational changes. PRACTICAL/MANAGERIAL IMPLICATIONS: Understanding the relationship between meaning and organisational change, and applying the model this article presents, can contribute to the overall success of change initiatives. CONTRIBUTION/VALUE-ADD: This study's primary contribution stems from the novel framework it presents for organisations to use the knowledge about how employees search for meaning to facilitate changes. The authors offer Burnes' words as a general introduction to this article. Burnes wrote that in a 'fast-moving and unpredictable world, there can be little doubt that organizational change is one of the most important issues facing organizations' (Burnes, 2004, p. 886). The need to use human capital as a competitive advantage has become a common discourse in the literature (Cascio, 1998; Cook & Crossman, 2004; Drucker, 2002; Gratton, 2000; McGregor, 1960; O'Reilly & Pfeffer, 2000; Prahalad & Hamel, 1990; Richardson & Vanderberg, 2005; Schuler & Jackson, 1999; Schuler, Jackson & Storey, 2001). The contention is that the organisations that succeed in contemporary business environments are those that engage the 'knowledge, experience, skills and energy of their people' (O'Reilly & Pfeffer, 2000, p. 3). However, employees are the 'organisational resources most difficult to control' (Perez & De Pablos, 2003, p. 82) because they 'can choose to give or withhold [their] knowledge' (Gratton, 1998, p. 13). According to Gratton (1998), the key to achieving employee co-operation, and a competitive advantage, lies in their search for meaning in or at1 work. According to Viktor Frankl's logotherapy (1967, 1978, 1984, 1986, 1988, 2000a, 2000b), meaning plays a crucial role in one's life. He proposed that discovering meaning will significantly improve one's quality of life, irrespective of the circumstances. Logotherapy aims to help one to find meaning, or purpose, in life (Fabry, 1987, 1988; Frankl, 1967, 1984, 1986, 1988, 2000a, 2000b). Research shows that employees rely increasingly on their work to define their own meaning in life (Bartlett & Ghoshal, 1994; Heil, Bennis & Stephens, 2000; Morin, 1995). However, organisational changes often threaten that which may be central to employees' experiences of meaning in or at work (Abel & Sementelli, 2005). These threats often result in resistance to change (Antonacopoulou & Gabriel, 2001; Frances, 1995). Burger, Crous and Roodt (2008) showed that employees' search for meaning could play a critical role in organisations' ability to manage changes. Based on the principles of logotherapy, they argued that organisations can reduce change resistance through interventions - known as 'Logo-OD' - that will address employees' experiences of meaning. Burger et al. (2008) also suggested a model for directing meaning-based interventions to facilitate organisational changes. This article seeks to explore further the model that Burger et al. (2008) presented. This model, which the section that follows discusses, suggests that organisations can use Logo-OD as positive trigger events to facilitate organisational changes, to assist with developing positive organisational contexts and to frame organisational changes. It can increase the readiness to change of employees and facilitate organisational changes more effectively. The researchers could find no such application of logotherapy in the literature. It suggests wide scope for exploring this area of study. The researchers will achieve this by presenting a brief overview of the model and its associated theoretical constructs. The problem statement, research objectives and motivation for the study, all of which relate to the further exploration of this model, follow. The researchers then discuss the research design and present a literature review that explores the concepts of positive organisational contexts and framing changes using Logo-OD. Burger (2007) used the term 'Logo-OD' to describe the application of logotherapy as an organisation development (OD) intervention. Burger argued that a logotherapeutic intervention could decrease change-restraining forces (resistance to change) and increase change-driving forces (readiness for change). The classic change model of Lewin (1951) showed that addressing these forces is essential to facilitate organisational changes successfully. Burger also argued that Logo-OD in isolation would not bring about the shift in attitudes that organisationsneedto reduce resistance to change. Instead, Burger proposed that these interventions would act as positive triggerevents to facilitate organisational changes. Avolio and Luthans (2006), as well as Luthans and Avolio (2003), used the concept of trigger events to describe critical incidents - planned or unplanned - that cause people to realise that they need specific courses of action or changes in behaviour to address particular situations. Burger (2007) argued that applying Logo-OD as positive trigger events can cause employees to find meaning during, or because of, organisational changes. Therefore, it plays a critical role in addressing the causes behind resistance to change. Consequently, Logo-OD helps to facilitate organisational changes. Figure 1 presents an adapted version of the model of Luthans and Avolio (2003) for Authentic Leadership Development (ALD) to explain how this article will apply the concept of Logo-OD. As a recommendation for creating positive organisational contexts and for framing changes using logotherapeutic principles, Burger et al. (2008) offered the framework of Pratt and Ashforth (2003) for organisational practices that promote meaningfulness (Figure 2) and logotherapeutic concepts that might help to frame changes (Table 1), respectively. By focusing on these frameworks for the rest of the article, Burger attempted to devise a theoretical model for using meaning at work to drive organisational changes. Consequently, the section that follows captures the problem statement that is central to this article. How can organisations use meaning to facilitate organisational changes?  to investigate the possible role of framing changes using Logo-OD principles to facilitate employees' experiences of meaning in or at work. Despite a substantial increase in literature that emphasises how important it is that employees find meaning in or at work, the researchers could find no comprehensive and empirically verified model in the literature for assisting employees to find this meaning. It is a significant gap in the knowledge about the effective facilitation of organisational changes. The model that Burger et al. (2008) presented is a first step toward constructing such a model. However, because this framework is new, there has only been research into one of its three central components: positive trigger events. Therefore, the rationale for the current study is to explore this model further in order to yield additional knowledge about the role that meaning can play to assist organisations in their change efforts. This knowledge can also serve as the foundation for empirical research into the applicability of the two remaining components: creating positive organisational contexts and framing using logotherapeutic principles to help employees to find meaning in the changing world of work. The arguments this article presents mainly follow the logotherapeutic school of thought, primarily because of the authority that this theoretical perspective enjoys in its description of, and research into, meaning in life Viktor Frankl, an Austrian psychiatrist-neurologist and holocaust survivor, developed logotherapy. His work is widely known and has been published in more than 23 languages (Havenga Coetzer, 1997; Washburn, 1998). The logotherapeutic outlook on meaning in life extends into the world of work in general and organisational change in particular. Therefore, the key concepts of logotherapy also yielded an evaluation framework used to build key arguments. Given the aims of this article, the researchers chose a literature review as their research strategy. It allowed them to explore the model of Burger et al. (2008) further and to construct a theoretical foundation for conducting empirical research into how one can apply this model to finding meaning in or at work. Literature reviews are very useful for facilitating knowledge of the area under study and for identifying the significance of work already conducted in the field. According to Hart (2005), they give an insight into how the subject developed and became established. Furthermore, Saunders, Lewis and Thornhill (2007) pointed out that literature reviews facilitate the identification and refining of research ideas that researchers may have overlooked in earlier research. The researchers conducted data searches of all portals available to the University of Johannesburg. They included searches of online scholarly journals using engines like EbscoHost, Infotrac and Emerald. The researchers searched a wide range of publications to ensure that adequate data supported the conclusions they drew. They used local and international literature as far as they could. The researchers sourced information by focusing on the components of the Pratt and Ashforth (2003) model and critical concepts in framing. With regard to the former, the focus of the search was on literature that addressed - either directly or indirectly -the implications of each of the components of the model. Based on the tenets of logotherapy, the researchers adopted an evaluative stance to determine whether these components can contribute to meaning in life. Finally, with regard to framing, they used literature from both the cognitive and postmodern frameworks to explore the implications of language - again against frameworks that logotherapy suggests. The researchers gathered their data specifically to meet the objectives of this paper. Key words contained in this article were the instruments for gathering the data. These key phrases included, firstly, generic phrases like 'meaning in work' and 'meaning at work'. Secondly, in terms of positive organisational contexts, they investigated each of the components of the model of Pratt and Ashforth (2003) independently. In other words, they used each of these components as key words to gather literature. Finally, with regard to framing, they focused their data collection on the use of this construct to manage changes. Therefore, they used phrases like 'framing and organisational change'. As the researchers noted earlier, they examined literature from both the cognitive psychological and constructionist approaches to framing. Their keywords yielded a vast amount of literature. Initially, the researchers refined their searches by including filters like 'Frankl' and 'logotherapy' to determine whether other researchers have explored similar concepts. In addition, they used search filters like 'meaning', 'meaning in life' and 'meaning in or at work' to reduce the vastness of the literature that is relevant to the more popular components of the model of Pratt and Ashforth (2003), like transformational leadership and organisational culture. The researchers then evaluated the body of literature for inclusion in this article. They evaluated it against the tenets and general principles of logotherapy. In addition, they scrutinised the research articles in terms of the relevance of their content to Frankl's work and the objectives of this paper. They evaluated both supportive and contrary arguments. As a final step, the researchers synthesised the data to present a comprehensive argument for applying the concepts of positive organisational contexts and framing to managing organisational change. Consistent with their approach for collecting data, the researchers analysed their data in terms of the value that the various themes they identified may add in helping employees to find meaning. The researchers evaluated the data they gathered for the model of Pratt and Ashforth (2003) against logotherapeutic principles to determine how much each of its components could help employees to find meaning. In their analysis of the data relevant to framing, the researchers focused on the extent to which the data conformed to Frankl's conceptualisation of meaning and, in particular, how framing can contribute to the search for meaning. Therefore, this analysis facilitated the construction of a solid conceptual base for future empirical research into the various components the researchers investigated, with particular emphasis on the role that each can play in helping employees to find meaning in or at work and in helping organisations to facilitate organisational changes successfully. The researchers present the data in two sections. Firstly, the researchers used the model of Pratt and Ashforth (2003) to guide discussion about how positive organisational contexts can help employees to find meaning in or at work. They used the logotherapeutic conceptualisation of meaning throughout. They evaluated each component of the model separately. Secondly, the researchers explored the concept of framing in terms of its importance in managing changes and the usefulness of Logo-OD principles to applying framing practices. Figure 2 offers the model of Pratt and Ashforth (2003) for organisational practices that promote meaningfulness as a framework for creating positive organisational contexts. The section that follows explores the model briefly to illustrate the role that each component might play in employees' search for meaning. Organisations' recruitment, selection and socialisation processes are at the core of the model. These practices have a significant effect on the extent to which employees experience a job-person or person-organisation fit. Recruitment and selection processes identify whether employees will 'fit' into organisations and their cultures (Byars & Rue, 2000; Schein, 1994), particularly when values are discussed early in the recruitment process to determine whether employees' values align with those of their organisations (Green, 2007). Socialisation practices, in turn, aim at improving this fit (Pratt & Ashforth, 2003) by 'transmitting key elements of an organization's culture to its employees ... [to shape] the attitudes, thoughts, and behaviors of employees' (Newstrom & Davis, 1997, p. 107). Such a fit promotes the expression of one's identity through one's work and helps employees to find meaning in their organisations and their jobs. In logotherapeutic terms, a job-person or person-organisation fit will create contexts in which employees will engage more comfortably and easily in creative and experiential values, thereby helping them to find meaning in or at work. Pratt and Ashforth (2003) argued that finding meaning in work links to the roles that employees play - or 'in what one does' (p. 314). The first practice they suggested could help to promote meaning at work is 'building cultures' that may encapsulate 'comprehensive ideologies' and 'collective level identities' (Pratt & Ashforth, 2003, p. 318; emphasis in original). Organisational cultures encompass shared systems of meaning that - as with ideologies - prescribe the assumptions, beliefs, values and norms that the members of the organisations hold (Newstrom & Davis, 1997). Burger (2007) showed that the cultures of organisations could have significant effects on how employees find meaning in them. Kurashina (2005) pointed out that organisational cultures involve shared values and norms through which employees derive meaning, whilst Strandgaard Pedersen and Dobbin (2006, p. 899) emphasised the notion of organisational cultures that provide shared or 'collective meaning'. Organisational identities encapsulate specific standards for employees' behaviour (Kurashina, 2005) and link strongly to - yet remain distinct from - organisations' values3 and cultures (Corley, Harquail, Pratt, Glynn, Fiol & Hatch, 2006). This construct poses a potential threat to organisational changes because employees more readily accept changes that they see 'as enhancing organizational identity' (Chreim, 2006, p. 315). In addition, Corley et al. (2006) posited that organisational identity-related issues 'engage profound and fundamental questions about meaning and being' (p. 96), which indicate the importance of this construct in assisting employees to find meaning at work. Organisational communities emerge through practices that promote employees' sense of belonging in organisations (Pratt & Ashforth, 2003). Workplaces often provide 'the most important sense of community' that people experience (Warren, 1996, p. 43) because of a lack of sense of community and the associated isolation one finds in contemporary society (Markow & Klenke, 2005). Therefore, promoting organisational communities may be crucial if employees are to find meaning in their jobs. According to Pratt and Ashforth (2003), organisations can promote these communities through practices that emulate 'family-like dynamics at work' and supporting missions4 that focus on values that go beyond organisational survival to give employees something to believe in (p. 318). Organisational values also link inextricably to Pratt and Ashforth's (2003) final component of promoting meaning in work: 'visionary5, charismatic, or transformational leadership6'. McDonald and Gandz (in Aust, 2004, p. 520) stated that 'leaders are fundamentally responsible for determining the values an organization embraces'. Leadership is crucial 'to help people understand why what they are doing is important and makes a difference' (O'Reilly & Pfeffer, 2000, p. 14) - or, in the context of this article, 'managing meaning in organizations is of central importance to leaders' (Smircich & Morgan, in Bean & Hamilton, 2006, p. 322). 'Charismatic leadership' relates to the emergence of more collectivistic values and a greater sense of community amongst employees. This affects the cultures of organisations (Xenikou & Simosi, 2006) and employees who see their leaders as 'an expression of themselves and thus intrinsically motivating and meaningful' (Markow & Klenke, 2005, p. 10). 'Transformational leadership', in turn, is associated with the motivation and inspiration of followers because it gives meaning to their work (Bass, 1985; Boerner, Eisenbeiss & Griesser, 2007) by tapping 'into deep levels of personal meaning' (Markow & Klenke, 2005, p. 10) and by focusing on 'the higher needs of employees' (Green, 2007, p. 23). Despite these propositions, Csikszentmihalyi (2003) showed that very few leaders engage in purposeful actions to ensure that employees experience this meaningfulness. One way in which organisations can promote a sense of meaning is by creating visions 'wherein organizational members experience a sense of calling in that their life has meaning and makes a difference' (Fry in Markow & Klenke, 2005, p. 10). Pratt and Ashforth (2003) argued that visions are crucial because 'like cultures, ideologies, and collective identities' they 'make membership within a particular organization special, enriching, and meaningful' (p. 318). From a logotherapeutic perspective, Burger and Crous (2002) showed that well-crafted visions may, in line with Frankl's (1984) concept of noö-dynamics, challenge employees with the potential meaning they have to fulfil, thereby creating tension in organisations to inspire employees to achieve their own and their organisations' growth. Meaningfulness at work involves a sense of belonging: 'Finding meaning in whom one surrounds oneself with as part of organisational membership, and/or in the goals, values, and beliefs that the organisation espouses' (Pratt & Ashforth, 2003, p. 314). Organisations can promote meaning in work through practices like redesigning jobs, employee involvement practices, path-goal leadership and nurturing callings. allow members to more fully engage who they are in what they do by increasing the variety of skills used on the job, allowing members to complete a whole and identifiable piece of work7, providing autonomy over what to do and when, and offering feedback to facilitate learning (p. 320). Lawler, Mohrman and Benson (in Pratt & Ashforth, 2003) argued that organisations can facilitate employee meaning through 'employee involvement' practices because these 'may effectively empower individuals by sharing information, developing knowledge, rewarding skill acquisition, inviting participation, and so forth' (p. 320). This is particularly clear when one considers surveys that show that large numbers of employees are 'disengaged or marginally disengaged' (Buhler, 2007, p. 18) and do not 'feel inspired by their organisation to do their best work or that senior managers are interested in them' (Towers Perrin Global Workforce Study, 2005, p. 4). Path-goal leadership is a contingency theory of leadership (Yun, Cox & Sims, 2006) that 'focused on follower satisfaction as the primary indicator of [leaders'] effectiveness' (Hopkins, O'Neil & Bilimoria, 2006, p. 251). This theory proposes that the role of leaders is to create work environments conducive to helping employees to achieve their organisations' goals (Newstrom & Davis, 1997). This will help employees' to find meaning in work, firstly by establishing the connection between their inputs and performance and secondly, by removing possible barriers that may undermine the meaning that one finds in work (Pratt & Ashforth, 2003). Finally, organisations can improve employees' experiences of meaning in work if employees experience their jobs as a 'calling' (Pratt & Ashforth, 2003). The traditional notion of a calling relates to religiously inspired work that serves others. However, modern conceptualisations describe a calling as work that adds meaning and purpose to one's life. Therefore, it results in 'deep connections and thus commitments to one's work' (Markow & Klenke, 2005, pp. 12-13). Employees with calling orientations find meaning in the fulfilment that doing the work itself brings. They experience work as 'a wholly enriching and meaningful activity' (Wrzesniewski, 2003, p. 302). Pratt and Ashforth (2003) maintained that finding meaning at and in work ultimately results in employees experiencing transcendence. In addition, organisations can cultivate transcendence using three organisational practices. These are providing a cosmology, promoting psychological safety and acting with integrity (see Figure 2). One uses the term 'cosmology' most often in the natural sciences and physics when studying the universe or cosmos (Fornaciari & Dean, 2002). Pratt and Ashforth (2003, p. 323) used the term to describe a comprehensive system of meaning that goes beyond concepts like an organisation's vision or sense of community and 'connects and explains' one's identity, membership, values, purpose and transcendence. 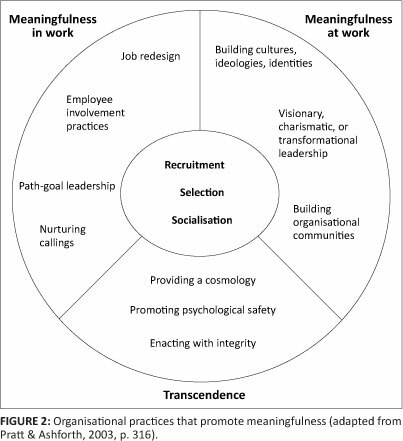 These belief systems promote transcendence by providing employees with direction and a place in a 'more ordered picture of the universe' (Weick in Pratt & Ashforth, 2003, p. 323) Schein (1994; 1996) argued that, during organisational changes, organisations must create a state of 'psychological safety' to prevent threats to employees' identity and integrity. It also prevents the resistance that results. In addition, Pratt and Ashforth (2003) argued that safety is crucial for one to 'leave one's old self-configuration for a new and uncertain one' (p. 323) to experience transcendence. Creating psychological safety is a central characteristic of transformational leaders (Alimo-Metcalfe & Alban-Metcalfe, 2006). Ideally, opportunity and the resources to engage in creative work must accompany this safety. This may be a significant challenge for contemporary organisations. Recent studies have shown that 'only 28% of today's workforce believe that their senior management has a sincere interest in the satisfaction and well-being of employees' (Towers Perrin Global Workforce Study, 2005, p. 8) and that only 39% of employees 'trust senior management' (Gostick & Telford, 2006, p. 35). Organisational change is an interpretative process. People act on their interpretations of the world. Therefore, their understandings must change if their actions are to change substantively (Davidson, 2006, pp. 23-24). According to Armenakis, Harris & Mossholder 'at its core, creating readiness for change involves changing individual cognitions in a set of employees' (1993, p. 283). Bringing about shifts in employees' reactions to changes require organisations to address how employees interpret or make sense of the changes. This section will address the notion of framing as a potential avenue for helping employees to interpret organisational changes in a way that helps them to find meaning in their organisations. Chreim (2006) maintained that 'framing plays a major role in change responses' (p. 316) to the extent that it affects 'acceptance of, or resistance to change' (p. 317). Framing denotes the process whereby organisations and their leaders manage meaning8 in organisations. They do this by 'selecting and highlighting certain facts or issues over others' (Bean & Hamilton, 2006, p. 324), thereby establishing the frames or boundaries 'within which a person can make sense of a particular phenomenon' (Weick in Bean & Hamilton, 2006, p. 324). Two perspectives relevant to framing organisational changes are particularly prominent in the literature. The first is that employees make meaning of changes through 'cognitive interpretation' (Bean & Hamilton, 2006; Bartunek, Rousseau, Rudolph & DePalma, 2006). This perspective proposes that employees generally engage in attempts to make meaning of change events by gathering and processing information cognitively. Through framing, organisations can create new systems of shared meaning that dictate which behaviours they require, thereby providing the foundation for mobilising employees towards the goals of the organisations that motivate the organisational change initiatives (Scroggins, 2006). The second perspective emphasises forming frames (or perspectives) through changes in the 'language' that organisations9 use. Rosenthal and Peccei (2006) maintained that organisational changes are more effective when a shift in language occurs to the extent that it becomes 'embedded in wider transformations of structure, practices and the physical environment' (p. 67). Such shifts in language are critical for bringing about changes in 'entrenched practices, attitudes and values' (p. 68) because language is a critical 'system for making meaning' that organisations use 'to represent and to construct particular ways of perceiving and thinking about experiences in the workplace' (Ayers, 2005, p. 5). Therefore, organisations need to change the language they use to describe changes if employees are to find meaning in the change initiatives. often gauge organizational change in terms of their own perceived or anticipated gains or losses from it, the extent to which change makes the quality of some aspect of their work or work life better or not (Bartunek et al., 2006, p. 188). In addition, organisations should construct their communications around visions that are powerful enough to create new organisational schemas. Organisations should also base them on the changes in language they require to frame their changes meaningfully. Logo-OD could be positive trigger events for organisational changes. Its underlying principles may also affect the extent to which organisations are able to create positive organisational contexts and frame organisational change initiatives in ways that will reduce resistance to change. Therefore, Logo-OD principles may be central to forming new employee and organisational schemas and to determining the language organisations should use to express their change initiatives. Burger et al. (2008) argued that five logotherapeutic concepts in particular could be useful here. They are the will to meaning, values, self-transcendence, noö-dynamics and the existential vacuum. 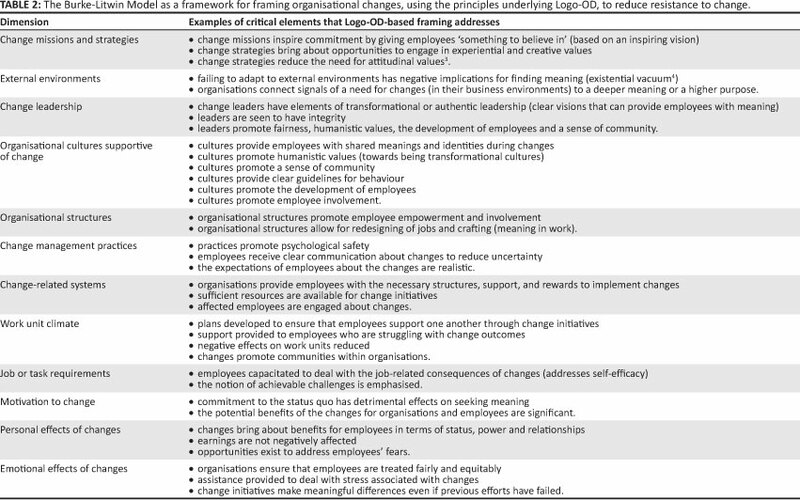 Table 1 summarised these concepts, together with the potential usefulness of each for framing changes.Given the purpose of framing in the context of this study, which is to reduce resistance to change, organisations may benefit from directing such framing in accordance with established models of organisational change. In other words, the principles underlying Logo-OD should influence the way that organisations approach changes to schemas and the language that is relevant to the particular aspects of organisations that could be epicentres of resistance to change. One framework that may be useful here is the Burke-Litwin Organisational Performance and Change model11. It consists of 12 categories divided into two groups: transformational and transactional variables (French & Bell, 1999). Whereas the transformational variables encapsulate the forces where changes may 'require entirely new sets of behaviour', transactional variables 'are influenced by short-term interchange between individuals and groups' (Kinnear & Roodt, 1998, p. 46). Table 2 presents the fundamental components of this model, together with examples of how organisations can use framing to address each of these to help employees to find meaning in their organisations and, ultimately, to show readiness for change.  frame changes that will help to reduce resistance to organisational change. In an earlier article, Burger et al. (2008) verified empirically the role that Logo-OD can play as positive trigger events for changes. Consequently, this article focused on exploring the remaining two meaning-based components - creating positive organisational contexts and Logo-OD based framing - through a literature review. Therefore, the importance and primary contribution of this study stems from the novel framework it presents for using the knowledge of how employees search for meaning during changes. Although researchers have written much about the role of meaning in work, the researchers could find no suitable framework in the literature. To meet the objectives of this article, the researchers presented their data in two sections. The first explored how organisations can create positive organisational contexts that will help employees to discover meaning. Here, the researchers presented the model of Pratt & Ashforth (2003) as a framework for creating organisational practices that foster meaningfulness. This framework distinguishes between practices for increasing meaning in work, meaning at work and transcendence. They showed that each of the components of this model could play a substantial role in assisting employees to find meaning. This will ultimately facilitate the transcendence of employees' needs toward the needs of their organisations. The second section of the literature review investigated the potential role of framing to help employees to find meaning during organisational changes. The researchers showed that there are two dominant perspectives about framing in the literature: the proponents of cognitive interpretation processes and those who focus on the role of language in creating meaning. Subsequently, the researchers argued that, regardless of the perspective organisations follow, it might be beneficial for them to base framing on Logo-OD concepts because they will directly address what logotherapy regards as the central motivation in people's lives - to find meaning - and help to reduce resistance to change. They also showed that specific change frameworks, like the Burke-Litwin model, could also assist to focus framing interventions for optimal effectiveness. It is clear that one must take cognisance of the role of meaning and its implications for organisations when they implement change interventions practically: 'assisting individuals in finding meaning should not be interpreted as organisational altruism - it makes business sense' (Burger et al., 2008, p. 32). Therefore, organisations should not see that the aim of the model the researchers developed in this article is to drive changes. In logotherapeutic terms, such a focus is hyperintention - a situation where a direct focus on a desirable state results in the state becoming unable to attain (Frankl, 1984). Instead, organisations must realise that changes in employees' attitudes will follow as a side effect of their finding meaning in the changing situation. The perceived integrity of the organisation and its leaders when they use Logo-OD and develop related interventions is critical. By ensuring that employees can relate to a higher purpose in their organisations, thereby 'making, or being able to make, a difference in the world', they will become more 'positive about work' and more 'work motivated' (Schlechter & Engelbrecht, 2006, pp. 3-4). Only when organisations achieve this state will they be able to achieve the objectives of the change initiative fully. The main limitation of this study is that, after the findings of Burger et al. (2008) on the role of Logo-OD as positive trigger events for changes, there has been no empirical evidence to support the value of using meaning to facilitate organisational changes. Evidence that supports the findings of this article comes from studies that may not relate directly to its purpose - a limitation that is largely because of the use of the literature review and the relative novelty of the field of study. In addition, one may argue that conceptualising meaning using only the approach of the logotherapeutic school of thought limits the applicability of this construct. The model the researchers presented for using meaning in change contexts provides a plethora of future research opportunities. Burger et al. (2008) have already established the relationship between meaning in life and resistance to change. Therefore, future research should focus on verifying the possible causal linkages between the various components of this model and employees' experiences of meaning empirically. In addition, developing instruments to measure meaning in or at work specifically, rather than investigating meaning in life in general, will be very useful (Burger, 2007). The literature increasingly suggests the crucial role that employees' search for meaning could play in the success of organisational change initiatives. However, there has been no comprehensive model to date that provides organisations with a framework to use this knowledge best. This article presented such a model, based on Logo-OD principles, together with an overview of how the model can assist employees to find meaning in their work contexts. The researchers recommend that researchers conduct further research to establish the usefulness of this model to facilitate organisational changes empirically. D.H.B. (University of Johannesburg), F.C. (University of Johannesburg) and G.R. (University of Johannesburg) all played critical roles in the conception and design of the research, the analysis and interpretation of data, and the drafting and revision of the article. Final approval of the version published was conducted by D.H.B. (University of Johannesburg). 1.This article explains the difference between 'meaning in' and 'meaning at' work later. 2.Post-test scores were higher than pre-test scores for the experimental group on all dimensions of the dependent variable in t-tests the researchers conducted for related samples and higher on 8 of the 12 dimensions on t-tests for independent samples. However, these differences were not statistically significant. The finding is consistent with the arguments that Logo-OD, in isolation, maynot be sufficient to bring about sustainable changes in employee attitudes to organisational changes. 3.Aust (2004) cited research that shows that organisations establish their identities by communicating their values. 4.Burger and Crous (2002) showed that mission statements could play significant roles in helping employees to find meaning in organisations and help them to achieve their goals despite the difficulties associated with organisational changes. 5.According to Pratt and Ashforth (2003), 'visionary leadership' is a synonym for 'transformational leadership'. Therefore, this article will not discuss this concept separately. 6.One can add the concept of 'authentic leadership' to this list, especially because it has a significant effect on organisations' principles and values (Avolio & Luthans, 2006, p. 195). 7.As opposed to the fragmentation of tasks associated with alienation (Haralambos & Holborn, 1995). 8.One needs to make a distinction between the concept of meaning, which denotes how people make sense of phenomena by interpreting them, and the concept of meaning that is the core of this study. 9.Particularly the language that leaders use. 10.Given the role that one assumes these factors play in creating positive organisational contexts, it is clear that the relationship between framing and the extent to which employees find meaning in their organisations is complex and multidirectional. 11.This model is the foundation of the Change Readiness Inventory (CRI), th< instrument that Burger et al. (2008) used to operationalise the resistance tc change-readiness for change dimension.